This Breton amusement park was opened in 1989, and is visited by about a quarter million people annually. 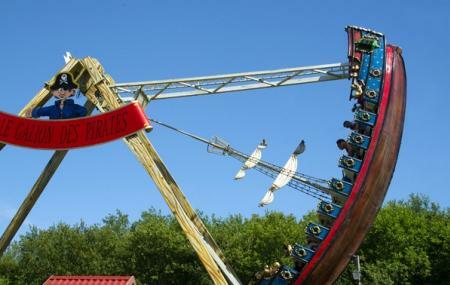 The various fun rides and attractions are scattered over 17 acres and a pretty lake. Entertaiment cover all sorts of activities such as bumper boats, circuit roller coaster, inflatable slides, trampolines, train-rides, go-karting, petting zoo, mini-bikes, bicycles, pedal boats and adventure circuits… the list goes on. There is also a camping area; you can rent a mobile home or a cottage, or get your own campervan, caravan or tent. Free for anyone shorter than 40 inches (1 metre). EUR 12.50 for under 12. Check attraction website for further deals. The park may be closed for extended periods September – April. Check the park schedule on the attraction website. You’ll have to drive down to the park. How popular is La Recre Des Trois Cures? People normally club together Kijou Parc and La Chamade Discotheque while planning their visit to La Recre Des Trois Cures. Nice day 6 hours comfortably. No penny pinching either . Great activity park for all the family. Highly recommended. Kids loved it. Could really do with some investment in modernization.